From Swellendam, it’s very easy to go to Cape Town for the day. It’s only 225km one way roughly, depending on where you’re going in Cape Town obviously. Whether you’re going to watch a movie, see a show, shopping, appointments or business, you can pick up take-out and be home in time for dinner right? 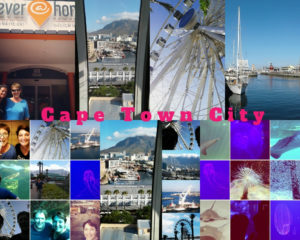 Last week I got to spend some time in Cape Town and I’d forgotten all the amazing things we offer our foreign visitors. For the first time in many years I took a ‘tourist day’ and decided to sleep over as there was no rush home this time. Green Point on Main, in their own words ‘one of the biggest, hippest hostels in Cape Town’ Never@Home was a huge surprise. From their perfect location, easy access to all destinations, the amazing team of people who keep the ball rolling to even boasting their own fantastic bar & restaurant, The Randy Warthog Bar & Grill, it’s just the perfect place to stay, for All reasons. We had just the best time, walked from Never@Home to the V&A Waterfront, yes, we walked! First we spent a few hours in the Two Oceans Aquarium, it provides a fascinating glimpse below the surface of the oceans that surround the South African coastline … what a treat! Then it was off to the Watershed, this beautiful and vibrant, massive arts and crafts warehouse is just jaw-dropping, an absolute must when visiting. Before strolling back, we decided to test our own ‘Big Wheel’ the ‘Cape Wheel’ with a 360° panoramic view of Cape Town, Table Mountain and the Waterfront, you can even see Robben Island, it was so much fun, this was the perfect way to end the afternoon. I was amazed how many people went out of their way to assist us, random strangers along the way, laugh with us, little jokes and just plain straightforward friendly-friendly people! We forget how wonderful Capetonians are. Big Smile!